This article is about Greninja's appearance in Super Smash Bros. Ultimate. For the character in other contexts, see Greninja. Greninja (ゲッコウガ, Gekkouga) is a playable character in Super Smash Bros. Ultimate. It was confirmed on June 12th, 2018. Greninja is classified as fighter #50. Billy Bob Thompson, Yūji Ueda, Frédéric Clou and Benedikt Gutjan's portrayals of Greninja from Smash 4 were repurposed for the English, Japanese, French and German versions of Ultimate, respectively. 7 Classic Mode: Your Turn, Greninja! Play VS. matches, with Greninja being the 58th character to be unlocked. Clear Classic Mode with Donkey Kong or any character in his unlock tree, being the sixth character unlocked after Sheik. Have Greninja join the player's party in World of Light. With the exception of the third method, Greninja must then be defeated on Kalos Pokémon League. Greninja, true to being a ninja-themed character, has very strong mobility similar to characters such as Sheik, Zero Suit Samus, and Sonic. This is notably evident with its walking speed (4th fastest), dashing speed (7th fastest), air speed (10th fastest), and rolls (both of which are tied for the game's second-fastest). However, unlike said characters, it maintains a strong set of KO moves, notably its smash attacks, throws (except down throw) and fully charged Water Shuriken. As with its appearance in Super Smash Bros. 4, this makes it a strong mix of speed and power. Greninja's ground game is very strong due to its frame data, being among the fastest in the game. To further compound this attribute, most of its attacks have low ending lag, granting it a strong combo game, notably with its down tilt, dash attack, neutral aerial, up aerial's linking hits, and back aerial's first and second hits. Adding on, all of its smash attacks have very fast startup and KO power for their speed, notably with up smash. Greninja also has a very strong air game due to its aforementioned air speed, jump height, and aerials that are reliable for multiple situations, while they all have low landing lag (except for down aerial, at 30 frames). Its neutral aerial is a decent low percent-combo starter (due to n-air's landing lag being pretty much nonexistent) and can also KO at high percentages, its forward aerial can KO very early at the edge, its up aerial can be used multiple times in a row to easily build up damage, its back aerial is a very fast offstage KO option, and its down aerial can be used to return to the stage or perform surprise combos. Greninja's grab game is overall very effective, due to its grabs being among the longest ranges of any non-tether grab in the game, two KO throws (forward, up), and a decently effective combo starter with down throw. Finally, Greninja's special moves are effective for various situations; Water Shuriken is a high-percentage KO option when fully charged, where due to hitting multiple times, Greninja can rush down its opponent and follow up with any aerial attack (except for down) or an up smash. Shadow Sneak works as an effective "ambush" option, Hydro Pump is a good recovery move (and can be used for gimping recoveries and pushing an opponent to the blast zone), and Substitute is a counterattack that can be aimed in one of 8 different directions upon a successful counter. Like all characters, Greninja is flawed in many ways. Greninja's primary flaws are its inability to break out of combos as well as a relative lack of KO setups. While Greninja has an easier time breaking out of combos due to the lower landing lag on all of its aerials, as well as the buffs given to Substitute, it still has difficulties in escaping combos due to its aerials still remaining relatively slow in startup lag. This can be alleviated with its back or down aerials or Shadow Sneak, but both are not very effective due to back aerial's almost entirely horizontal hitboxes, down aerial's landing lag, and Shadow Sneak's "eyes" now flashing just before the attack comes out. Finally, even though Greninja has an easier time KO'ing opponents, it still has trouble in doing so due to a general lack of reliable KO setups. At high percents, one can down tilt to an up-smash (after running a bit in front) but this is only true at specific percents. At even higher percents, down tilt can combo into forward aerial, after that Greninja has to resort to one of its KO throws. Mistakes are not tolerated with the ninja frog. 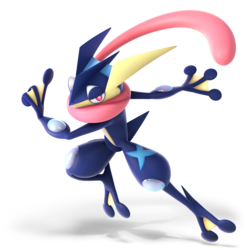 Altogether, Greninja's playstyle requires players to think like an actual ninja: utilizing running speed and fast attacks to rush down opponents, but while saving the slower attacks for potential mixups, mindgames and surprise KO options. Despite being considered a high-tier character in Super Smash Bros. 4, Greninja has been greatly buffed from Smash 4 to Ultimate. As with all other characters in the game, its already strong mobility is even faster, while its previously situational moves (such as dash attack, down smash and Water Shuriken) are much more versatile. Due to the game's universal changes to dash mechanics, Greninja can also further exploit his amazing ground mobility, allowing for easier setups into his combo starters, such as down tilt and dash attack. Furthermore, the reduced landing lag on Greninja's aerial attacks gives it an easier time landing, while the universal 3-frame jumpsquat improves Greninja's ground-to-air potential. However, its biggest buffs were to its grab game, which saw an even faster standing grab, while its forward and back throws can now KO in addition to its up throw. As a result of receiving multiple buffs with relatively few nerfs, Greninja retains its status as a viable character in Ultimate's early meta with above average representation as of late thanks to Stroder, Some, Lea and iStudying. Greninja's model features a slightly more subdued color scheme. Every move that once used water katanas now uses water kunai, similar to when Ash's Greninja uses Cut in the Pokémon anime. Greninja's tongue has less physics-based movement than the previous game. Greninja has altered animations for its sidestep, roll, and airdodge animations; it now disappears in a small whirlwind with leaves scattering, similarly to when Substitute is successful. Like all characters, Greninja's jumpsquat animation now takes three frames to complete (down from 4). Greninja dashes faster (2.08 → 2.288). Greninja walks faster (1.43 → 1.502). Greninja has increased air speed (1.18 → 1.239). Greninja weighs less (94 → 88). This worsens its survivability but makes it less susceptible to combos. The ability to tech footstools hinders Greninja's combo options. Greninja's down taunt has lower knockback and much higher ending lag; unlike other taunts, it is not interruptible (unless it's used during Shadow Sneak). This prevents it from KOing and makes Greninja more vulnerable while using it. However, due to how incredibly situational down taunt is, this is negligible in normal play. Neutral attack's rapid jab is considerably faster. Jab 3 deals less damage (3.5% → 3%), and thus less knockback. Down tilt is now a downward hand sweep. Down tilt launches opponents at a more upward angle, improving its combo potential. Down tilt has less ending lag (FAF 27 → 23). Down tilt deals less damage (7% → 4%), and also deals more knockback, narrowing its combo range. Dash attack has an altered animation with Greninja stopping halfway through the spin. Dash attack deals more damage (7% → 8%). Dash attack has less ending lag (FAF 31 → 29). Forward smash deals more knockback. Down smash has much less startup lag (15 → 10), and thus a shorter duration (FAF 55 → 50). All aerials have less landing lag (Neutral: 12 → 7, Forward: 15 → 11, Back: 13 → 10, Up: 15 → 14, Down: 32 → 30). Neutral aerial has considerably less ending lag (FAF 65 → 53). Neutral aerial deals slightly more knockback. Forward aerial deals more knockback. Back aerial has less ending lag (FAF 46 → 41). Down aerial has more endlag when it hits an opponent, hindering its combo potential and making it slightly less safe on shield. Greninja no longer loses its double jump when it lands down aerial. Greninja can act out of a missed down aerial sooner (FAF 57 → 52). Late down aerial KOs vertically slightly sooner. Standing grab's startup is reduced by 1 frame (11 → 10). Pummel is significantly faster than in Smash 4. It deals 1% less damage (2% → 1%), but is buffed overall due to Greninja's previously sluggish pummel. Forward throw deals more damage and knockback, now boasting KO potential. Back throw has a new animation. Greninja turns around and throws the opponent with both hands. Back throw's animation is faster, making it harder to DI properly. Edge attack has increased damage (7% → 9%). Water Shuriken has slightly increased range. Opponents don't fall out of the fully charged shuriken as much as before. Uncharged Water Shuriken has less knockback growth. Greninja now cloaks itself in a whirlwind before disappearing. It may also perform a forward kick to attack. Shadow Sneak's attack has less startup. Forward Shadow Sneak launches at a lower angle, improving its combo potential. Shadow Sneak can be used multiple times in midair. The shadow's eyes flash red just before release, making it easier to predict the attack. Substitute's counter window is longer. Substitute's attack has less startup. Substitute slows down the opponent when the attack activates, allowing the attack to land more consistently. Substitute now grants Greninja invincibility during the attack. Substitute has more vibrant particles effects. Hydro Pump now has an arrow pointing in the direction of travel, similar to Pikachu's Quick Attack. Hydro Pump can now be ledge-cancelled. Greninja no longer loses its double jump if it is hit out of Hydro Pump. Greninja now turns into Ash-Greninja during its Final Smash. Greninja and its opponents are no longer silhouetted during the attack. A visual glitch with Greninja's screen KO has been fixed. Hydro Pump's endlag can no longer be cancelled instantly by landing on a moving or slanted platform. Water Shuriken deals less shield damage. Greninja is able to crawl, wall cling, and wall jump. 7.3% A hook kick which stops half way. It can be angled and can lock opponents. 4.5% Greninja attacks with his tongue. A good aerial combo starter. 4% Greninja does a downward hand sweep. It sends opponents at an upward angle, making it a versatile combo starter. Notably, it can confirm a KO into an up smash rather easily. 8% A sweep kick. Sends opponents at a favorable angle for combos. 14% An inward slash with a water kunai. Deals good knockback and has good range. However, it has notable startup lag. 5% (hit 1), 14% (hit 2 clean center), 11% (hit 2 clean sides), 10% (hit 2 late) Two reverse gripped inward slashes with water kunai. Greninja's strongest finisher, especially when hit clean. 13% (kunai), 11% (arms) Hits both sides with water kunai. Due to it sending opponents at an semi-spike angle and coming out on frame 10, it is a quick and effective way to set up an edge-guard situation. 11% (clean), 6% (late) Strikes a ninjutsu pose while emitting an exploding water bubble. 14% A forward slash with a water kunai. It has some start-up and suffers from high end lag, but it is a viable edge-guarding and KOing option. 3% (hit 1), 2.5% (hit 2), 6% (hit 3) Kicks backwards three times. It is Greninja's fastest aerial attack, although it is also one of the weakest aerials of its kind. However, this makes it a useful combo tool in return. 1.3% (hit 1-5), 3% (hit 6) A corkscrew flying kick. One of Greninja's best combo and KO tools, as it can juggle and KO effectively due to its great jumping prowess. 8% A diving double foot stomp. It acts as a stall-then-fall and bounces off opponents. The clean hit meteor smashes opponents. The descent can be stalled by using Water Shuriken. — Grabs with a whirlpool. While its standing grab is slow, it is among the longest-reaching grabs in the game, and its dash grab comes out quickly for its range. 1% Compresses target with water. Decent speed. 3.5% (hit 1), 4.5% (throw) Shoves the opponent forward. Can KO at high percentages. 9% Greninja leans forward and flings the opponent backwards. Like forward throw, its decent knockback gives it good edgeguarding and KO potential at high percentages. 11% Tosses the opponent upwards. One of Greninja's most useful throws, as it can combo into a up tilt, up aerial, up smash at low and medium percents and can even KO at later percents. 12% Slams the opponent onto the ground. It can combo into a down tilt, forward tilt, and forward smash and a Shadow Sneak at low percentages. 8% Sweep kicks around itself while getting up. 9% Performs a roundhouse kick while climbing up. Water Shuriken 3%-10.8% (uncharged), 1.0% (fully charged looping hits), 9% (fully charged final hit) Uses Water Shuriken, which can be charged. Depending on how long the move is charged, the shuriken will be larger and do more damage, however the speed and distance will decrease as a result. At full charge, it hits multiple times and is a decent KOing option. Shadow Sneak 10% (normal), 12% (reverse) Disappears briefly, then preforms a forward kick or a drop kick (relative to the user's reappearance in relation to the enemy) to attack. The move activates when the special button is released. The way the shadow moves is relative to Greninja's position, and it can be moved further or closer to change how far Greninja teleports. While performing Shadow Sneak, Greninja cannot run, attack, grab, dodge or shield. However, it can walk slowly, jump and taunt. Hydro Pump 2% (per shot) Uses Hydro Pump to propel itself in the inputted direction, depending on if the special button is held or not, it can be used once or twice. Each shot has a windbox effect that pushes opponents, making it a decent option for gimping predictable recoveries. Substitute 14% (up or down), 11% (left or right) Does a pose, if anyone hits it while posing, Greninja will temporarily disappear and get replaced by a wooden log or a Substitute doll then appear behind the opponent and strike them. It deviates noticeably from other counters, as the attack itself can be angled in an inputted direction and launching the opponent in that direction (with the down input meteor smashing opponents, which makes it a good punish against reckless edgeguarders). Secret Ninja Attack 6% (the mat), 50% (Total in the attack after mat) Turns into Ash-Greninja and attacks the opponent with a mat. If an opponent is caught in the mat, Greninja will send them up into the air and strike the opponent repeatedly in midair with its kunai, before slamming them down with a final hit. Up Taunt: Stands upright, clasping its hands together before assuming a ninjutsu stance. The stance resembles one of its attack animations from the Pokémon series. Side Taunt: Shakes head from side to side, causing its tongue to whip out in the same directions. Particles of saliva fly off with each whip. Down Taunt: While standing on one foot, Greninja holds out its hands, faces the screen, and summons small sprays of water. The sprays can do 1% or 2% damage and produce some knockback, though they're able to KO only at above 420%. A video showing the exact KO percentages at which each character can be KO'd can be found here. Unlike the rest of Greninja's taunts, this one cannot be cancelled (unless Shadow Sneak is being charged before using it). Does a few hand seals with splashing water, and then a ninja pose. Does a flip, and crosses its arms. Elexiao - Placed 1st at Phoenix Blue 2.
iStudying - Placed 25th at Valhalla II and 7th at Tech Republic IV. Lea - The best solo Greninja player in the world. Placed 9th at Frostbite 2019, 5th at Umebura SP and 7th at Umebura SP 2. MkLeo - Plays Greninja as a secondary. Placed 1st at Smash Ultimate Summit with a win over ZeRo. Oisiitofu - One of the best Greninja players in Japan. Placed 5th at Sumabato SP and 9th at Sumabato SP 2. Stroder - One of the best Greninja players in the world. Placed 5th at Ultimate Nimbus, 7th at Heart of Battle, and 13th at 2GG: Prime Saga. He has wins over Tweek and ESAM. Classic Mode: Your Turn, Greninja! Greninja fights against characters that represent different types from the Pokémon games: for example, Charizard and Bowser represent Fire type, and Mewtwo, Ness, and Lucas represent Psychic type. 1 Charizard and Bowser Pokémon Stadium Battle! (Elite Four) / Battle! (Solgaleo/Lunala) Charizard's Pokémon Trainer is absent. 4 Ivysaur Pokémon Stadium Battle! (Gladion) Ivysaur's Pokémon Trainer is absent. 6 Squirtle and Greninja Kalos Pokémon League Battle! (Champion) - Pokémon X / Pokémon Y Squirtle's Pokémon Trainer is absent. Greninja was among the fighters that were summoned to fight the army of Master Hands. During the opening cutscene, Greninja was present on the cliffside when Galeem unleashed his beams of light. Greninja leaped into the air to avoid one of the beams, which hit Lucario instead. Greninja was hit shortly after and vaporized, getting imprisoned by Galeem afterward along with the other fighters, sans Kirby. A puppet fighter cloned from Greninja is later seen alongside ones cloned from Fox, Samus, Link and other fighters. Greninja was one of the many fighters that fell under Dharkon's control upon Galeem's first defeat, and it can be found in the Realm of Darkness in the path necessary to advance, making it an obligatory unlock. Greninja is later seen among several other fighters, making their last stand against Galeem and Dharkon. It also shows up in the bad ending where Galeem emerges victorious against Dharkon, witnessing Galeem engulf the world in light. Greninja's Fighter Spirit can be obtained by completing Classic Mode. It is also available periodically for purchase in the shop for 500 coins. Unlocking Greninja in World of Light allows the player to preview the spirit below in the Spirit List under the name "???". As a Fighter Spirit, it cannot be used in Spirit Battles and is purely aesthetic. Each Fighter Spirit has an alternate version that replaces them with their artwork in Ultimate. Greninja coming to a halt on Kalos Pokémon League. Charging Water Shuriken next to Ryu on Suzaku Castle. Performing its neutral aerial with Leviathan on Midgar. With its Substitute Doll on Wuhu Island after tripping. Performing Shadow Sneak on Luigi's Mansion. Struck by Lucario on Pokémon Stadium 2. In the Pokémon series, Ash-Greninja is only obtainable as a male. The fact that Greninja transforms into Ash-Greninja for its Final Smash, Secret Ninja Attack, implies that Greninja is a male in Ultimate. Greninja's new character portrait resembles its air dodge animation. Coincidentally, Greninja's fighter number, 50, is the same as the number of its costume in Super Mario Maker. This page was last edited on April 18, 2019, at 18:42.